Trinity Designs: Happy 4th Everyone! I'm just sharing some of my favorite photo's with you today because the card I have planned for the weekly Blogger's Challenge is not finished yet. I will be posting it next week, but I spent most of my week being Mom and Wife and not Stamper! We are actually out of town from today until late Sunday, but when I come back, I'll be without my daughter for a whole week! She is staying with her grandparents for a visit! Yes, of course I'll miss her - but man, have I got some work to catch up on! In the meantime, I've scheduled a post for Saturday so you'll have something new to look at over the weekend. Then it's back to regularly scheduled programming on Monday! 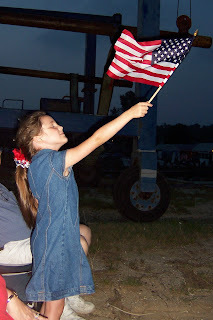 These pictures are from July 4th 2004. Emma and my Dad were in the local parade on Main St. in my parents home town that day. She had so much fun throwing candy out to the onlookers. Later on, we went to watch the fireworks from the local boatyard and Emma was enjoying the evening breeze with her flag. That 4th remains one of my all time favorites, ever! I hope you all have a fabulous 4th with your loved ones! I love this holiday so much! I'm very patriotic and enjoy the celebration each year of just being an American. My Dad is a veteran and our good friend Greg is serving in Iraq right now, so I can't help but remember that the liberty we enjoy is bought with a price. I hope to never take it for granted. God bless you all today, my friends - and GOD BLESS AMERICA! Happy 4th Robin from the Anderson Family. My Mother loved the card that Mitz created.